Love reading and things associated with books. This book has been on my TBR for a number of years, but for one reason or another, I was just unable to get around to reading it, but after hearing a number of times on a number of podcasts, I knew I had to read it. I felt that for the first little bit of the book was a bit slower than I had expected it to be, but once I was engrossed in Charlie's world, I was hooked and had a hard time pulling myself away from the book. What I really liked was the letter format of the story and how it gave the reader a really good insight into the mind of a person who is struggling to find their place in a world that doesn't really seem to have room for those who tend to contemplate the things that are pressed upon them, with little or no warning, that makes life a little more complicated for them. I did read this book because others were reading the book and also because I really enjoyed reading her previous work, Eleanor & Park (at some point I'll get to Attachments, which I have heard is also pretty good and am looking forward to reading Landline this coming fall). It took me awhile to get into this novel, probably because I was comparing it to my experience with Eleanor & Park, in which I got right into the book. But once I was able to get into the book, I really couldn't put the book down and got into Cath's world, not only because of the story, but also because to a certain degree, I also wrote fanfiction at one point, but nothing to the extent that Cath did. 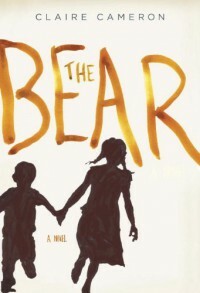 I really liked how the author was able to express Cath's trouble with trying to find her place in a world that was free of her dad and her sister and to find friends that understood her as much as her sister may have and the struggle that she had with not being with her sister all the time. I had heard really good things about the book and I thought I would give the book a try. 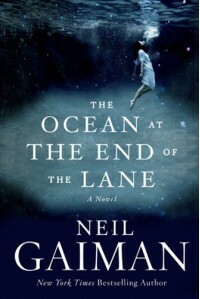 Much like when I read The Ocean at the End of the Lane, I had to suspend my disbelief when I read the book and just let myself experience the book. While it took me a bit to get into the book, I did manage to enjoy the book. I can't recall what made me enjoy reading the book, as it's been awhile since I finished the book, but it was probably the way the author used language that made it enjoyable and how she was able for me as the reader to draw me into the world she created. It was also great that it was such a short book after reading a book with over 1000 pages. After reading A Game of Thrones, I suspected that I would be a bit let down with the second book. What I found with the book was that it tended to be bleak and dreary to the point that at times I wondered when I was ever going to get end the least bit happy and I felt that the book seemed to plod on for pages on end, with the book never seeming to end (felt like I was going through torture myself at times), especially since the first book seemed to be full of action and plot twists coming left and centre. 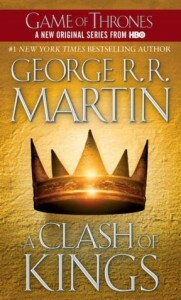 Being it the case, since I have gotten this far in the series, I am definitely in it for the long haul and will find out who gets to claim the throne, if there is anybody left in the end. 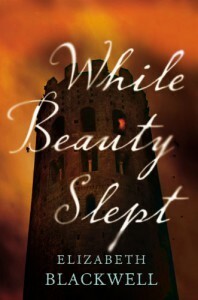 I quite enjoyed the book, even if I didn't see elements of Sleeping Beauty within the book (after reading some reviews of the book through Goodreads, I do realize that I did miss them, even though some of them were quite clear as day and it probably doesn't help that I am not as familiar with the story of Sleeping Beauty, as I am with Snow White and Cinderella). 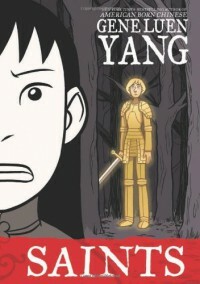 I really like Elise's storyline and was drawn into it more than those of the aristocrats, but for some reason I struggled with the book, even though it took me five days to read it from start to finish; clearly there was some sort of pull with the story that allowed me to be drawn into the story and complete it. I will admit from the outset that I read this book because a lot of people were reading the book and because there was a lot of praise for the book. 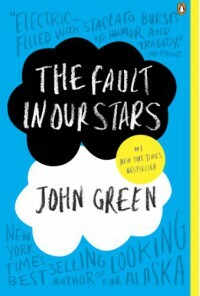 While the book was good in spots and that probably was fairly realistic (I have never battled cancer, although my dad did when I was much younger, but it was never as bad as Hazel's nor Augustus') to what some teens go through while battling cancer, there were times I wanted it to be better. 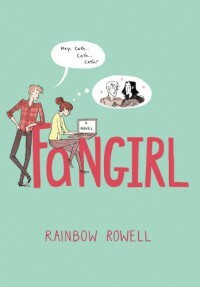 Maybe it was due to the fact that a lot of people were saying good things about the book and I was hoping that it would be as good for me as it was for them and maybe I was trying to compare it to Eleanor & Park or maybe it was a combination of the two, but for some reason it just didn't click with me. I found the story to be a bit simplistic at times and found that maybe the two characters could have been written up a bit better. I don't know why but this has become one of my favourite novels; I think it has partly to do with the historical detail, but it probably it is more likely due to the fact that Dickens uses language so well and allows the reader to be drawn into the story as much as possible. So when a readalong was organized by a blogger that I follow, I had to definitely do it. 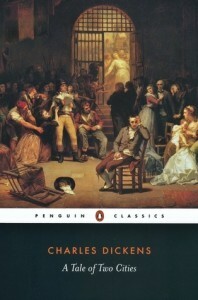 One thing that I liked about the book is how Dickens draws the reader into the world that he creates in the days leading up to the French Revolution and even the one during; it also doesn't hurt that the book is a really good example of how detail can add to the overall story and how it has the ability to make the experience of reading that more enjoyable. While the vast majority of the book is well done, I did find that the last little bit of the book a bit rushed, but I will give Dickens the benefit of the doubt on that one, as there is too much of the book is too well done that it would be nitpicking on a book that in all respects is well-written and has a lot of amazing detail in it. Prior to reading this book, I had seen a review or two, which piqued my interest in the book. And when I was able to sit down with the book and read it, I basically ripped through the book and could really feel the intensity of the kids trying to get help. It took me a couple times to read the beginning to understand what exactly happened. But once I had gotten through the first pages of the book (basically got myself launched into the book), I was able to get swept into the rhythm of the book and felt like I was right there with the two kids. 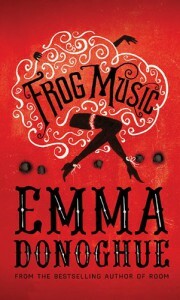 When I heard that Emma Donoghue had written a new book, I really wanted to get my hands on a copy, especially since I had really enjoyed Room a number of years ago. The thing with the book was that I had a bit of difficulty figuring out where the book was during the time span of the book, as it seemed to jump around quite a bit and left me a bit confused as to where we were in terms of the story, which apparently is about a month. 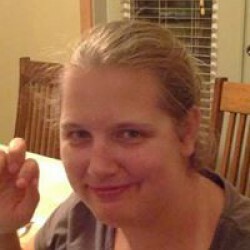 I would have really like it if author's that are doing time shifting of any sort to let reader's know where we are. I had no problem in loving Donoghue's writing, I just had an issue with the time shifting. 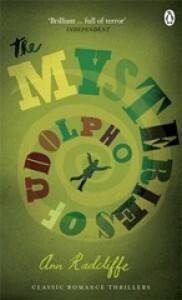 I quite enjoyed this read and found it to be a fairly light read compared to something like The Mysteries of Udolpho. One of the reasons that I read it was due to it being recommended on the blog Austenprose and I am pleased for the positive review of the book. 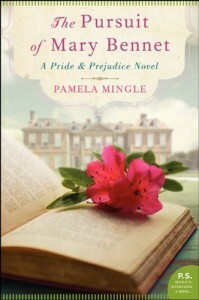 It was well done and something that was fairly believable and done in the style of Austen's books, even though the cast of characters wasn't as broad as that of Pride & Prejudice. Even though this was a book that I had wanted to read for sometime, I struggled with it. While reading the book, I found that I really couldn't keep my interest with the book and found it to be a bit of a chore, even though at times I could get myself engrossed with the story. I found it to be something that I read for long periods of time without figuring what was going on and all of a sudden I got interested in the story for a bit and the process would repeat itself. I really enjoyed this read. I don't know why I particularly liked the book, but I suppose it had something to do with the fact that I was really tired when I read the book (read this during the latter portion of Dewey's Readathon in April) or the language was in such a way that honestly I didn't care about what where the book was going or maybe it was both. But I liked the pacing of the book and how one could easily be drawn into the story and not really care to find deeper meaning. I was so entranced with the book that very shortly into the book. I had to basically suspend reality and not try to define what was real and what wasn't, especially since one really can't tell the difference and therefore reality became muddled. 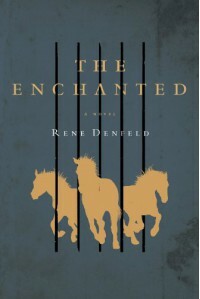 I wasn't exactly enamoured with the book and had a bit of difficulty getting through the book. It's not that I don't enjoy reading fables, its just that the meaning is sometimes lost on me and that I have a tendency for me to possibly to read too much into a story, which I possibly did in this instance. What I did like was that it was short and was a fairly quick read. 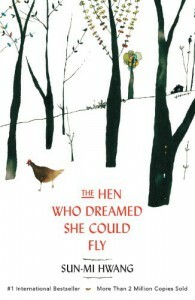 I wasn't particularly moved by the story and it felt like the language was stilted at times. This was the conclusion to Boxers and used characters and events from the previous book, so it would be very helpful to read Boxers before reading this book. I was able to get through this book fairly quickly, but I was a little disappointed that this side of the story wasn't as developed as Boxers was developed and felt that the author shortchanged the readers with the second half, but maybe there wasn't as much material to work with as there may have been with Boxers. But being that its been several months since I read this book, my recollection isn't that great, but as a whole, it is one that I would read, particularly if I am a fan of graphic novels. I first heard about this book from Michael Kindness on the podcast Books on the Nightstand, that he co-hosts with a colleague, Ann Kingman. Not that I am gaining anything from this, but I would highly recommend downloading the podcast, as they have excellent book recommendations and discuss some really important topics and generally have a good time with it. 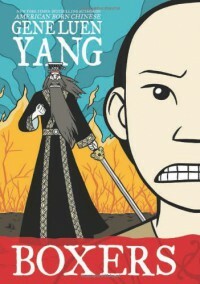 Anyways, after hearing the recommendation for the book and its sequel, Saints, I immediately sought out the books and being a fan of the Maus books by Art Spiegelman, it piqued my interest, even though this is more a fictionalized representation of the Boxer Rebellion. I wasn't disappointed with the book and was able to get through the book more quickly than I had expected to, especially since it took me sometime to get through Blankets a number of years back. I did think that it would take me awhile to get through the book, even though it was a graphic novel. 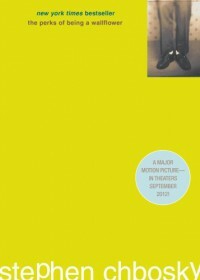 I first heard about this novel through Hear...Read This! as one of their first selections and because the book sounded interesting. 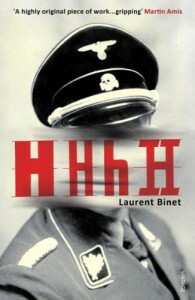 I had never heard about Reinhard Heydrich (may have heard his name his name in course of my history courses in university, but it never probably clicked in my head) and once I had received the book, I did some research on him and trust me he was not one you wanted to cross, both in life and in death. What I liked about the most about the book is that the chapters were very short, mostly about a third to a half page and that you could see the author's thought process, at least I think it was, interjected with a bit of history of the Czech resistance movement. It was interesting to read a book that took from the Axis side that didn't involved the civilian population. If there was something that bothered me was that when the author would spend a lot of time in the present and not return to the historical aspect of the book as quickly as I would have liked the author to.